Just like every solid relationship, communication is key! Take it from our Stylist-in-residence, Laurie H., who knows the ins and outs for getting a great Fix every time. From adding captions to your Pinterest pins to sharing feedback (every time! ), everything you communicate contributes to sending you stylish surprises that you'll be sure to love. So get ready to tell us everything about you—we'll be sure to listen (and tell you about us too!). Here are Laurie’s tips for building a solid relationship with your Stylist! Pour yourself a cup of hot tea (or red wine, who are we kidding! ), and tell me all about yourself; I’m a really great listener! Let me know about your life, your loves, your insecurities, even your favorite color—I want to know it all. We personal stylists LOVE when you include details like “shades of orange don’t look great on me” or “I don’t like to show off my knees.” Notes like these help me select personalized pieces for you, so don’t be afraid of sharing finicky tidbits about yourself. If it’s your first Fix, remember: we’re just getting to know each other! Don’t feel pressure to keep all five pieces. My goal? For you to keep 1-2 items you love so we can get the conversation started. Remember to leave lots of feedback on the items you don’t love. True story: I sent a client a button-back sweater in her last Fix. She didn’t love it in the box—she didn’t feel the neckline or cut would be flattering. But, the second she put it on, it was her new favorite sweater. Even if you don’t like it immediately, try it on; it’s the only way you’ll be able to give honest feedback (or fall in love with it). My favorite thing about Stitch Fix? That my clients trust me to send them pieces that are a bit out of their comfort zone. Us Stylists take pride in finding you pieces you’ll love, so try to be open to items you didn’t request or pin. And don’t peek before your Fix arrives! When you’re leaving item feedback, be specific about why things didn’t fit or why you loved them (color, print, cut, etc). Pro Tip: If you keep pieces to gift to friends or family, be sure to leave that in the feedback. If you keep it, we assume it’s for you! If I had a first choice for superpowers, it would be mind reading (I’d love to know exactly what you’re looking for!). But until this happens, feel free to ask for specifics in your Fix Note. Looking to try a new trend or need something for a vacation? Let me know! I love looking through the items you pin from our Outfit Ideas gallery—it’s such a great source of inspiration. But what’s even better? When you leave me detailed notes about why you love something in your pin captions, like the wash or length of a pair of jeans. Another way to keep your Stylist in the loop? Use Style Shuffle, our interactive tool that you can play online or on our mobile app at any time. We’ll show you product and you’ll either give it a big thumbs up or down! The more you play, the better we get to know you—plus it’s just plain fun. Just log in to your profile and start liking what you see! As your personal style evolves, so should your Style Profile. Keep it current, so we’re always in lock-step. Pro Tip: Make sure to fill in the note at the end of your Style Profile—it’s the first place we turn to learn about you. 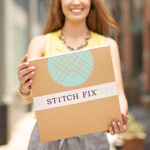 New to Stitch Fix? Learn more about how it all works!